The announcement came on Tuesday 12 Tishrei, hours before the deadline for candidates to register in the Jerusalem Rabbinate race. Har Nof Chief Rabbi David Yosef Shlita announced he will not run in the upcoming race to elect a new Sephardi Chief Rabbi of the capital. It is believed that Rabbi Yosef is aware that after Rishon L’Tzion Rabbi Shlomo Amar Shlita entered the race with the backing of Jerusalem Mayor Nir Barkat and the Bayit Yehudi party, Rav Amar is likely to win the election. 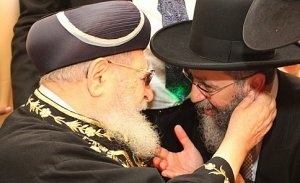 The candidates in the race for Sephardi Chief Rabbi include Rabbi Amar and former Shas MK Rabbi Chaim Amsellem Shlita, Rabbi Mordechai Toledano Shlita, and Rabbi Yehuda Chaik. In the Chief Ashkenazi Rabbi race the candidates include Rabbi Aryeh Stern Shlita, Rabbi Eliyahu Schlesinger Shlita, Rabbi Avraham Chanoch Kutiner (Mosdos Merkaz Hatorah, Bnei Brak), Rabbi Yehoshua Zender Shlita, Rabbi Yehuda Rosenthal Shlita (Dayan Chanichei Yeshivos, Bnei Brak) and Rabbi Eliyahu Rosenthal Shlita (Dayan in Petach Tikvah). At present, Rabbi Amar is expected to emerge the victor along with Rabbi Stern.